On Thursday evening, I had the pleasure of attending the Kit & Ace Supper Club, at their brand new studio (167C 2nd Avenue). 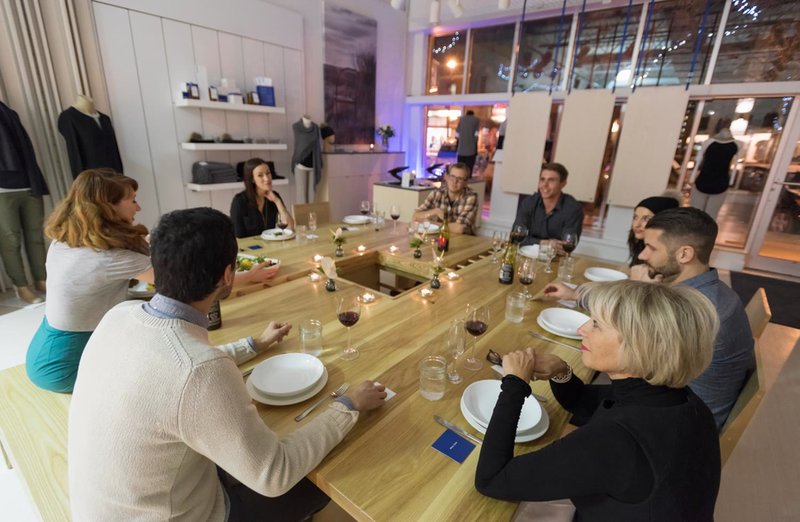 Born from the pop-up dinner party trend that has only recently begun to hit Saskatchewan, Kit & Ace has adapted the concept to function as a catalyst for creating conversations by bringing together people who are "up to cool things" in the local community. The evening's guests included a gallery owner, event planner, graphic designer, fashion buyer, artist, photographer, and more. For the purpose of the weekly Supper Club, the studio features a large wooden table custom designed by Noah Rossmo, part-owner of local furniture store, Green Ark Collected Home. At this table, the other guests and I enjoyed a locally-sourced meal by Mike McKeowan, the inspired chef behind Prairie Harvest Cafe (if you haven't been, you must go!). Emily Brazill, shop director for the Saskatoon studio, made the connections that brought guests together and facilitated engaging conversation. Kit & Ace is a contemporary luxury fashion startup by Shannon and JJ Wilson - the wife and son of Lululemon founder, Chip Wilson. Every Kit & Ace piece is made from Qemir (pronounced "come here"), a blend of cashmere, elastane, and rayon, also referred to as "technical cashmere". Shannon, previously head designer at Lululemon, developed the fabric as a machine-washable alternative to cashmere that would be durable, have size integrity, and hold it's shape. Styles have a streetwear aesthetic which will transition well through a multitude of settings, yet are basic enough to go with anything. Kit & Ace's launch party is Friday. Stay tuned for highlights from the event! All images thanks to Electric Umbrella.